The House of Virgin Mary is located on the top of the “Bulbul” mountain 9 km ahead of Ephesus, we went there early in the morning before leaving Ephesus. 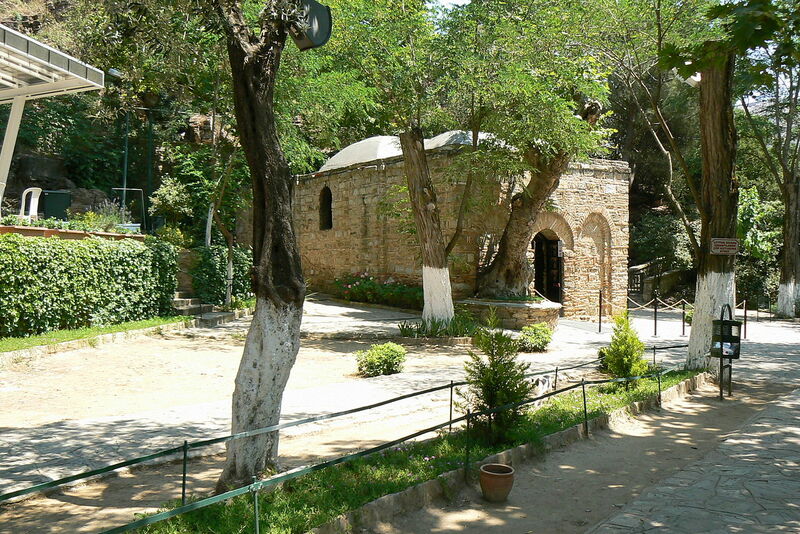 The house of Virgin Mary is an example of Roman architectural building entirely made of stones back in the 4th AD. The quiet house is surrounded by the lush greenery. You can light the candle inside the house and offer a prayer and have some quiet moment. Really serene and peaceful place. 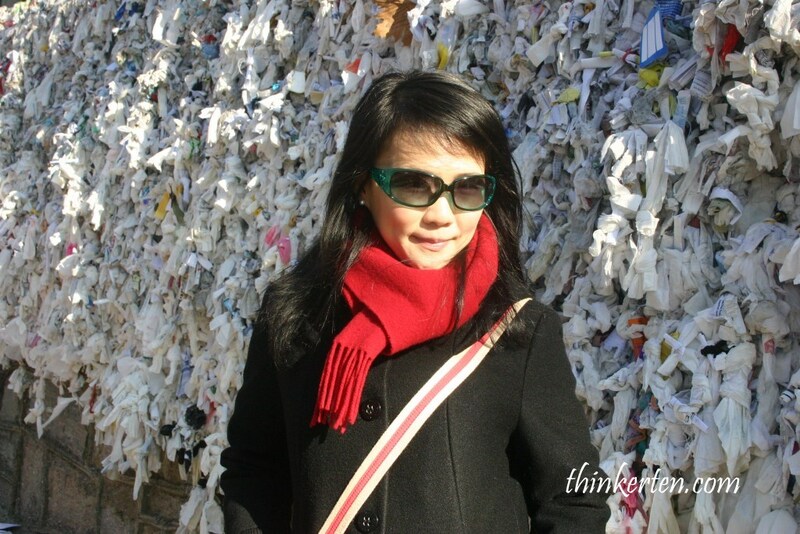 The wishing wall nearby House of Virgin Mary which pilgrims have used by tying their personal wishes and hope on white paper or fabric. 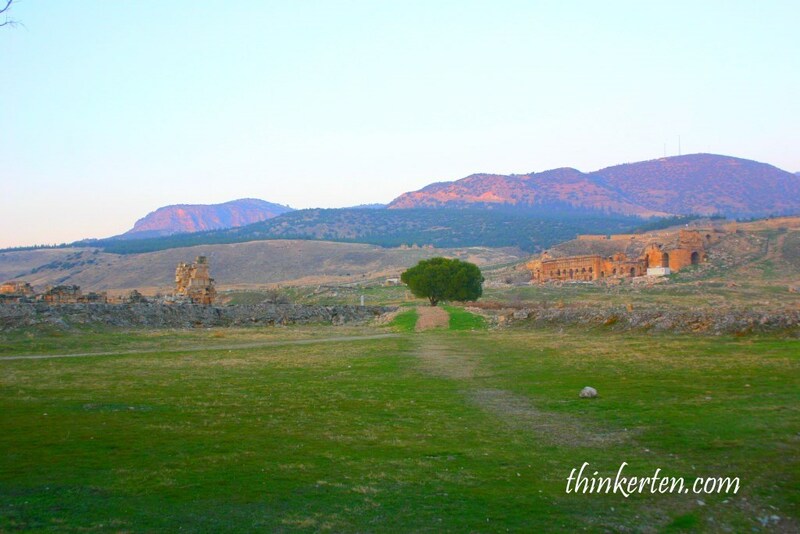 The city of Hierapolis is located near the cotton castle. 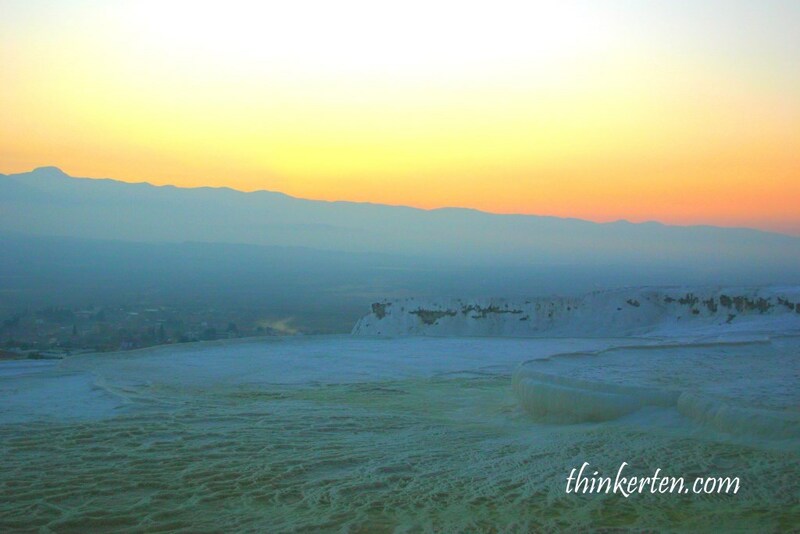 First we visited the city Hierapolis before dipping our feet to the cotton white pool. 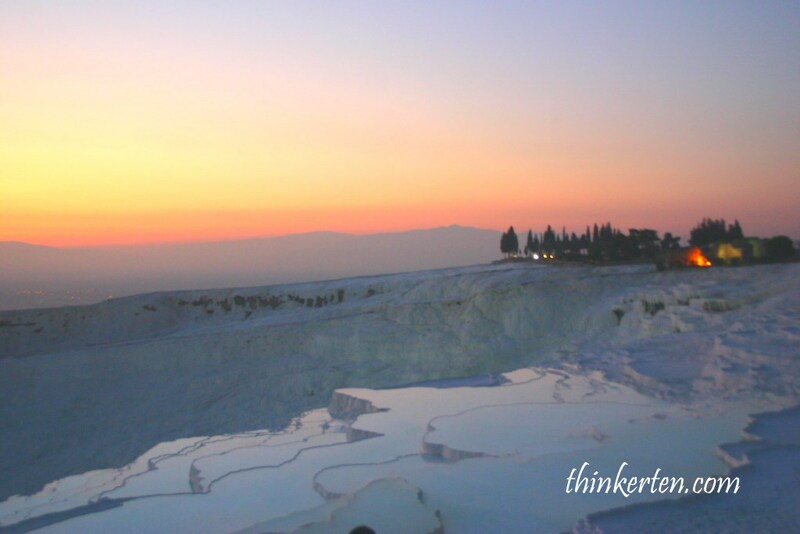 When we reached the site, what caught my eyeballs was the Pamukkale cotton castle, the white milky fairy looking pool, I was not so much attracted by the ancient city of Hierapolis. 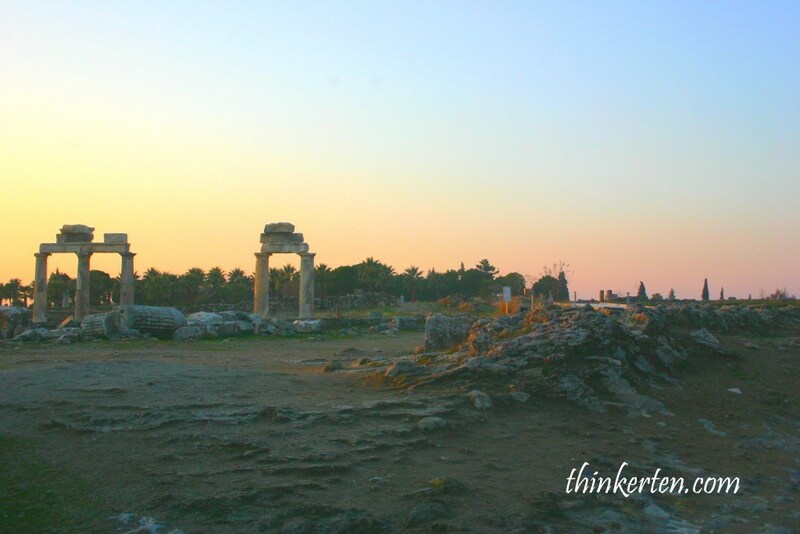 There is a wooden platform to walk through the gate and see the whole city of Heirapolis. Thousand of rocks which are the base for the ancient building behind me. To be frank, I am kind of tiring of looking at the old ruins for the past few days. After all I am not an archaeologist! 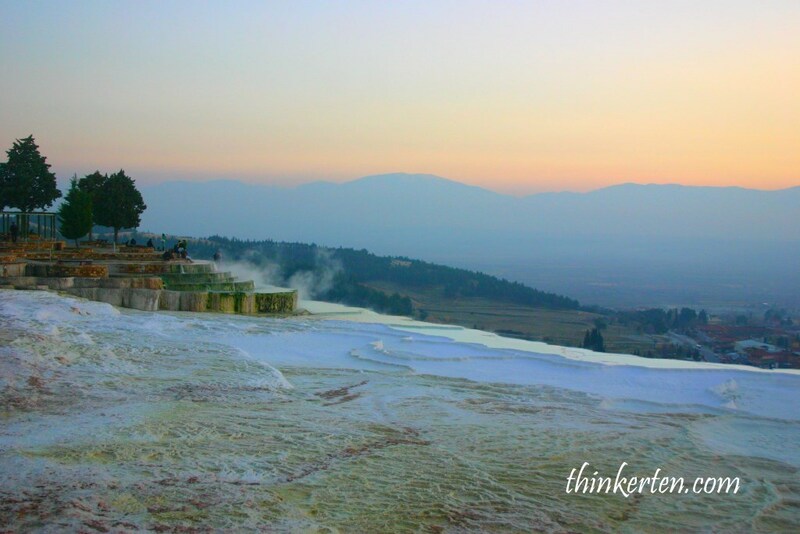 Hierapolis, an ancient city was founded as a thermal spa then became a healing center where doctors used the thermal spring water nearby as a source of treatment for the patients. 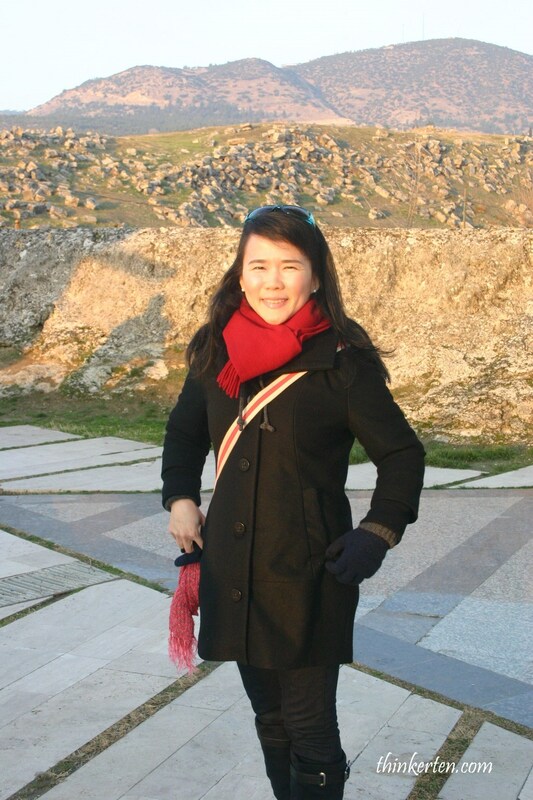 Because we were rushing for the sunset at the cotton castle, so we din’t really walk all the way up to check out the ancient city of Hierapolis. If you arrive by noon, then you may have enough time. I heard there is a big Roman theater which can sit up to 15000 people. There is also the Cleopatra’s Pool, water is warm enough to bath and drink too. When I saw this big white cottony appearance pool, I was speechless! This is one of the bizarre geological phenomenon which I have seen so far. For once, I thought I was in another planet. But soon I was awaken by hundreds of tourists beside me. 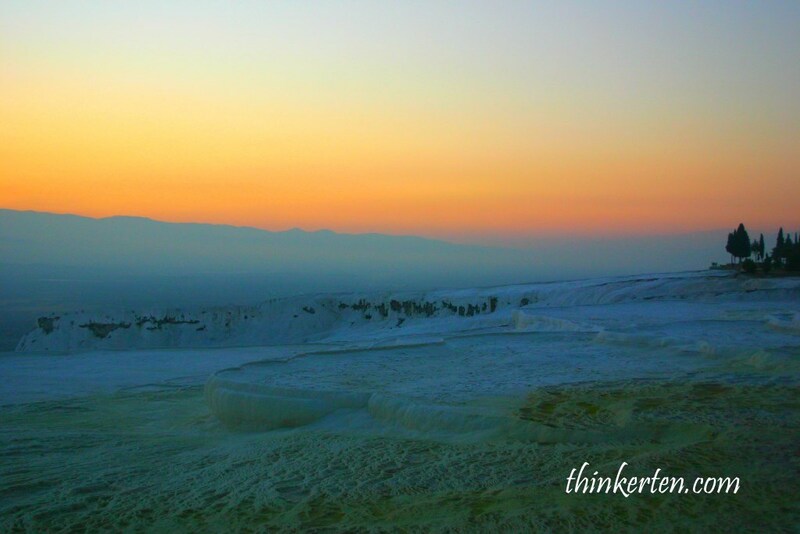 Pamukkale is situated in a small town in south western Turkey, it is better known with its mineral-rich thermal water/hot spring water that flow down the bright white terraces of a steep valley side. 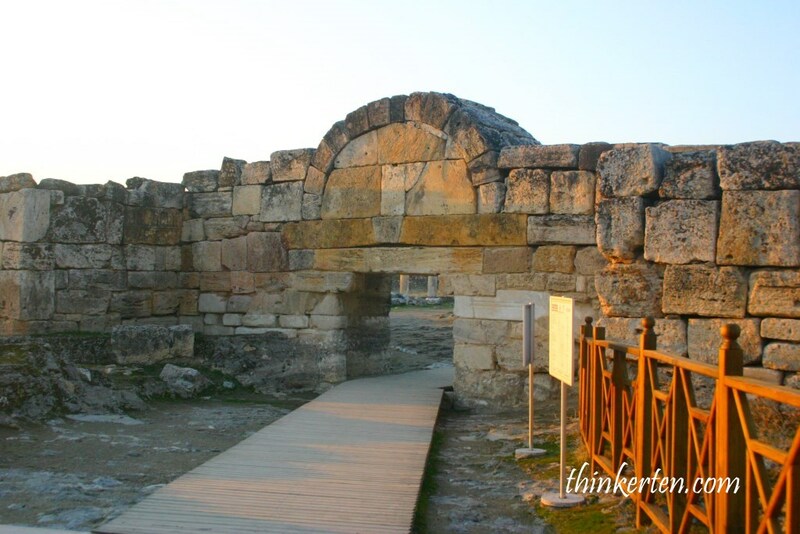 The doctor in the city of Hierapolis would use this thermal water which contain high minerals to help cure patients. 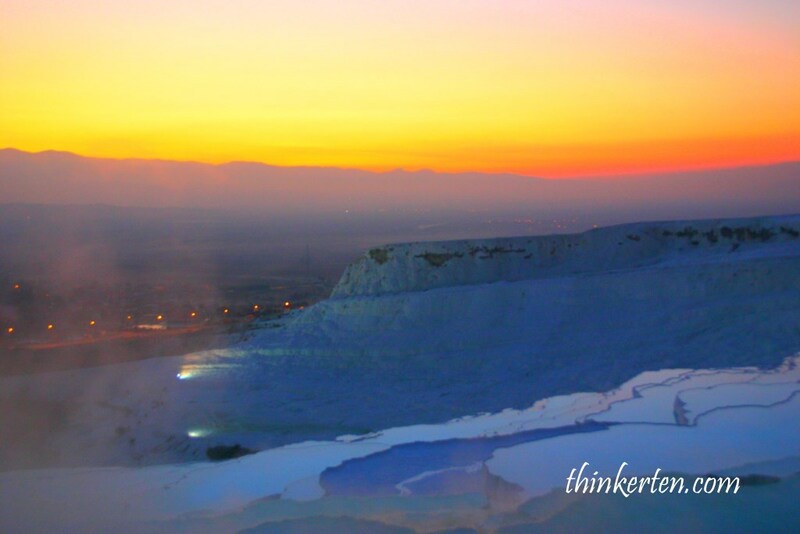 We stayed a little longer to watch for the exceptional sunset view at Pamukkale. We took off our shoes and soaked our feet on the warm thermal water. It was a great feeling. No shoes is allowed as it would damage the path. The water is not very deep here, slightly above the ankle only. Do bring along a tower to dry your feet after soaking into the thermal water, else you may catch a cold. Water is so blue and clean! It is very slippery when we stroll along the water with our barefoot. One need to be extra careful, else you may fall down to the valley, quite dangerous. I saw few tourists fell down to their butts, luckily not down to the valley. Before the night turn dark, I saw the houses at the foot of the mountains has already turned on their home lights which make the whole place even more beautiful. In winter sunset start at around 4.30 pm onward. Before 5.30 pm the whole place is considered really dark. So you may want to plan your sunset view accordingly. This is one of the highlight in my Turkey tour. 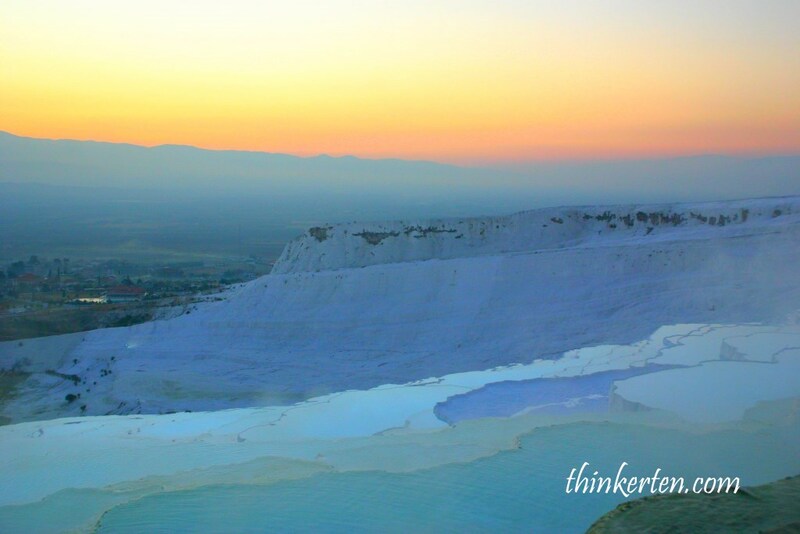 When I think of Turkey, I think of Pamukkale, the blue water in the white cotton castle. 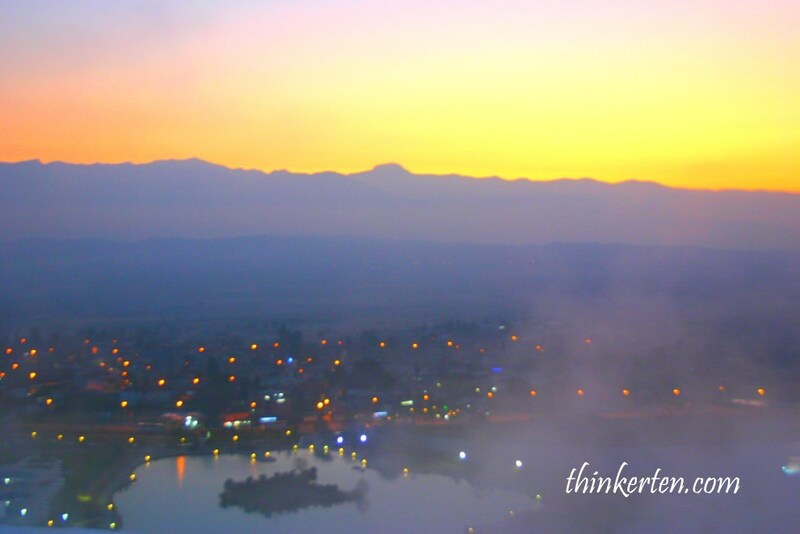 Turkey 5 : Konya – Getting to know more about Rumi!